The Darwin VAAC reported that a minor ash plume from Ibu rose to an altitude of 2.4 km (8,000 ft) a.s.l., drifted about 17 km NE, and dissipated. An ash plume rose to an altitude of 2.1 km (7,000 ft) a.s.l. later that day, and to 2.4 km on 23 March; both plumes drifted E. The Alert Level remained at 2 (on a scale of 1-4), and the public was warned to stay at least 2 km away from the active crater, and 3.5 km away on the N side. Based on satellite and wind model data, the Darwin VAAC reported that during 25-26 February ash plumes from Ibu rose to altitudes of 2.4-3 km (8,000-10,000 ft) a.s.l. and drifted NE and ENE. A thermal anomaly was also visible. The Alert Level remained at 2 (on a scale of 1-4), and the public was warned to stay at least 2 km away from the active crater, and 3.5 km away on the N side. PVMBG reported that during 5-12 February dense white-to-gray plumes from Ibu rose 200-800 m above the summit and drifted E, S, and W. Foggy conditions occasionally prevented visual observations. The Alert Level remained at 2 (on a scale of 1-4), and the public was warned to stay at least 2 km away from the active crater, and 3.5 km away on the N side. PVMBG reported that on 11 December an ash plume from Ibu rose to 1.8 km (6,000 ft) a.s.l., according to the Darwin VAAC. Weather clouds prevented views of the plume in satellite data. The Alert Level remained at 2 (on a scale of 1-4), and the public was warned to stay at least 2 km away from the active crater, and 3.5 km away on the N side. The Darwin VAAC reported that on 26 November an ash plume from Ibu was identified in satellite images rising to 1.8 km (6,000 ft) a.s.l. and drifting SE. The Alert Level remained at 2 (on a scale of 1-4), and the public was warned to stay at least 2 km away from the active crater, and 3.5 km away on the N side. PVMBG reported that at 1223 on 19 October an event at Ibu generated an ash plume that rose 400 m above the crater rim and drifted E. Another event at 1809 on 22 October generated an ash plume that rose 400 m above the crater rim and drifted N. On both days seismic signals indicated explosions and rock avalanches. The Alert Level remained at 2 (on a scale of 1-4), and the public was warned to stay at least 2 km away from the active crater, and 3.5 km away on the N side. Based on satellite images and model data, the Darwin VAAC reported that on 6 October an ash plume from Ibu rose to 1.8 km (6,000 ft) a.s.l. and drifted WSW. Based on satellite images and wind model data, the Darwin VAAC reported that on 28 and 30 September ash plumes from Ibu rose to 1.8 km (6,000 ft) a.s.l. and drifted NE and N.
PVMBG reported that at 1742 on 20 August an event at Ibu generated an ash plume that rose 1.2 km above the crater rim. The Alert Level remained at 2 (on a scale of 1-4), and the public was warned to stay at least 2 km away from the active crater, and 3.5 km away on the N side. PVMBG reported that at 1852 on 28 July an event at Ibu generated an ash plume that rose 5.5 km above the crater rim and drifted SE. An event at 1612 on 29 July produced an ash plume that rose 4.8 km and drifted N. Ash plumes later drifted SE. Seismic signals for both events were characterized by explosions and avalanches. The Alert Level remained at 2 (on a scale of 1-4), and the public was warned to stay at least 2 km away from the active crater, and 3.5 km away on the N side. Based on satellite images and PVMBG (a ground observer) notices, the Darwin VAAC reported that on 6 July an ash plume from Ibu rose to 2.1 km (7,000 ft) a.s.l. and drifted N. The Alert Level remained at 2 (on a scale of 1-4), and the public was warned to stay at least 2 km away from the active crater, and 3.5 km away on the N side. Based on satellite images and model data, the Darwin VAAC reported that on 27 June an ash plume from Ibu rose to 1.8 km (6,000 ft) a.s.l. and drifted W. The Alert Level remained at 2 (on a scale of 1-4), and the public was warned to stay at least 2 km away from the active crater, and 3.5 km away on the N side. 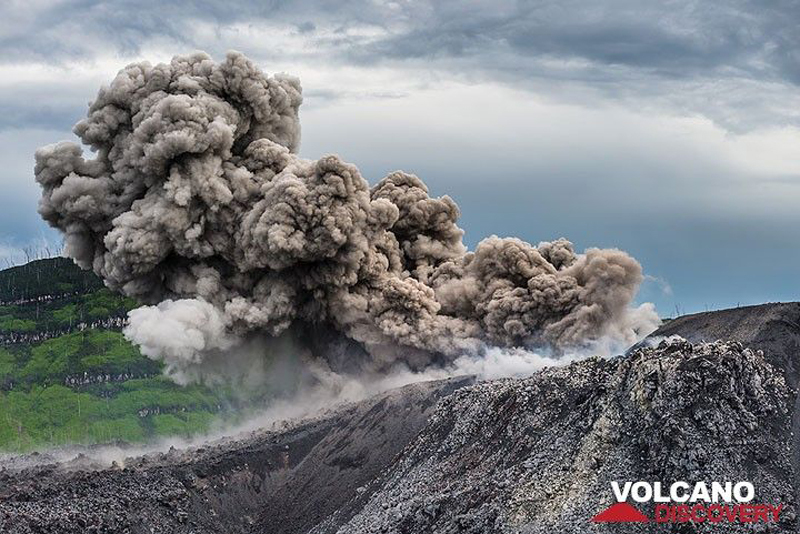 PVMBG reported that at 0857 on 21 June an event at Ibu generated an ash plume that rose at least 600 m above the crater rim and drifted N. Signals indicating an explosion and rock avalanches were detected in seismic data. During 22-26 June ash plumes rose as high as 850 m and drifted WNW and W. The Alert Level remained at 2 (on a scale of 1-4), and the public was warned to stay at least 2 km away from the active crater, and 3.5 km away on the N side. PVMBG reported that during 14-19 June white-to-gray plumes rose 200-600 m above Ibu’s crater rim. The Alert Level remained at 2 (on a scale of 1-4), and the public was warned to stay at least 2 km away from the active crater, and 3.5 km away on the N side. PVMBG reported that at 1206 on 6 June an eruption at Ibu generated an ash plume that rose at least 500 m above the crater rim and drifted N. An event at 1750 on 12 June produced an ash plume that rose 600 m and drifted N. The Alert Level remained at 2 (on a scale of 1-4), and the public was warned to stay at least 2 km away from the active crater, and 3.5 km away on the N side. PVMBG reported that at 1822 on 30 April an eruption at Ibu generated a dark gray ash plume that rose at least 500 m above the crater rim and drifted E. The Alert Level remained at 2 (on a scale of 1-4), and the public was warned to stay at least 2 km away from the active crater, and 3.5 km away on the N side. Based on satellite images and model data, the Darwin VAAC reported that on 24 and 28 August ash plumes from Ibu rose 1.5-1.8 km (5,000-6,000 ft) a.s.l. and drifted W.
Based on PVMBG observations, webcam and satellite images, and wind data, the Darwin VAAC reported that during 9-12 and 14 June ash plumes from Ibu rose 1.5-1.8 km (4,800-6,000 ft) a.s.l. and drifted N, W, and SSW. PVMBG reported that eruptions at Ibu on 1 and 5 June generated ash plumes that rose 150-250 m above the crater and drifted N and SE, respectively. Based on PVMBG observations and satellite images the Darwin VAAC reported that during 26-27 and 29-30 April ash plumes from Ibu rose 1.5-1.8 km (5,000-6,000 ft) a.s.l. and drifted E, NE, and N.
Based on PVMBG observations the Darwin VAAC reported that during 19-21 April ash plumes from Ibu rose 1.5-1.8 km (5,000-6,000 ft) a.s.l. and drifted E and N.
Based on ground observations, PVMBG reported that during 7-8 April ash plumes from Ibu rose to an altitude of 1.7 km (5,500 ft) a.s.l. and drifted N. During 10-11 April ash plumes rose to altitudes of 1.5-1.6 km (4,900-5,200 ft) a.s.l. and drifted S.
Based on analyses of satellite imagery, the Darwin VAAC reported that on 15 January a minor ash plume from Ibu rose to an altitude of 2.4 km (8,000 ft) a.s.l. and drifted almost 30 km E. On 17 January PVMBG noted that an ash plume rose to an altitude of 1.5 km (5,000 ft) a.s.l., or 200 m above the summit, and drifted E.
PVMBG reported that during 1 June-22 August white-to-medium-gray plumes rose as high as 800 m above Ibu’s summit crater and drifted E, although inclement weather often prevented visual observations. Seismicity was dominated by signals indicating surface or near-surface activity, and the continued growth of the lava dome in the N part of the crater. The Alert Level remained at 2 (on a scale of 1-4). The public was warned to stay at least 2 km away from the active crater, and 3.5 km away on the N side. PVMBG reported that during 7-22 March gray-to-gray-black plumes rose as high as 700 m above Ibu’s summit crater, although inclement weather often prevented visual observations. Seismicity was dominated by signals indicating surface or near-surface activity, and the continued growth of the lava dome in the N part of the crater. The Alert Level remained at 2 (on a scale of 1-4). The public was warned to stay at least 2 km away from the active crater, and 3.5 km away on the N side. PVMBG reported that during 1-17 November white-to-gray plumes rose as high as 450 m above Ibu’s summit crater. Seismicity was dominated by signals indicating surface or near-surface activity, and the continued growth of the lava dome. The Alert Level remained at 2 (on a scale of 1-4). The public was warned to stay at least 2 km away from the active crater, and 3.5 km away on the N side. PVMBG reported that during 1 August-3 November white-to-gray plumes rose as high as 500 m above Ibu’s craters. Seismicity was dominated by signals indicating surface or near-surface activity, and the continued growth of the lava dome. The Alert Level remained at 2 (on a scale of 1-4). The public was warned to stay at least 2 km away from the active crater, and 3.5 km away from the N side. CVGHM reported that white plumes from Ibu rose to an altitude of 1.5 km (5,000 ft) a.s.l. during 17-31 March and were spotted "often." The plume altitudes increased to 1.6 km (5,200 ft) a.s.l. on 31 March. During 4-5 April, seismicity increased in amplitude and plume altitude increased to 1.8-2.0 km (5,900-6,600 ft) a.s.l. On 5 April, the eruption plume was gray and material fell onto the crater. The Alert Level remained at 2 (on a scale of 1-4). The community was not permitted to climb or approach the crater. Ibu volcano on Halmahera island started erupting on 31 December 1998. A plume rose to 1,000 m above the summit as a result of mild explosions. On 2 January, personnel from the Volcanological Survey of Indonesia (VSI) who went to the island to take COSPEC measurements observed an eruption. Ashes were deposited to ~3 mm depth in surrounding villages. On 5 January another eruption lasted for 60 minutes. Local people reported that a lava flow reached the lower lip of the crater on 16 January. Information Contacts: R. Sukhyar and Dali Ahmad Volcanological Survey of Indonesia (VSI), Jalan Diponegoro No.57, Bandung 40122, Indonesia (URL: http://www.vsi.esdm.go.id/). Local residents first noticed thick gray ash emissions from the summit on 18 December 1998 (corrected from BGVN 24:01); this information reached the Volcanological Survey of Indonesia (VSI) Gamkonora volcano observatory on the 31st. On 2 January personnel from VSI who went to the island to take COSPEC measurements of the SO2 release observed a loud eruption that caused up to 3 mm of ashfall in and around Tugure Batu Village. The eruption lasted 35 minutes and generated a plume 1,000 m high. Another eruption observed on 5 January 1999 lasted for 60 minutes. Thunderclaps from the summit were heard on 16 January and a night glow from ejecta was evident above the summit area. Residents also reportedly saw lava at the crater rim. The seismometer from Gamkonora (an RTS PS-2) was installed ~2 km from the summit of Ibu on 3 February along with an ARGOS satellite system tiltmeter. Field observations on 11 March revealed continuing eruptions and rumbling noises, but the larger eruptions (accompanied by booming and thick ash ejection) had decreased to a rate of one every 15-20 minutes. When observed on 2 February larger eruptions occurred every 5 minutes. Seismograph records are still dominated by explosion events; during 9-15 March there were 779 events, increased from 673 events the previous week. The last reported activity at Ibu included ash emission and mild ash explosions in September 1999. A May 2000 photo showed a lava dome covering the crater floor. MODIS data after May 2000 indicated thermal alerts during 28 May-3 October 2001 (figure 1). The series of alerts was consistent with continued inflation of, or extrusion onto, this dome. Note that the alert was barely above threshold, and it is likely that Ibu was just below detection threshold through 2002. A discussion of the MODIS technique was included in BGVN 28:01. Figure 1. MODIS thermal alerts on Ibu during 2001. Thermal alerts collated by Diego Coppola and David Rothery; data courtesy of the Hawaii Institute of Geophysics and Planetology's MODIS Thermal Alert Team. The Directorate of Volcanology and Geological Hazard Mitigation (DVGHM) released ten nearly identical weekly reports on Ibu during 31 May-29 August 2004. They noted that Ibu emitted "white ash" (steam plumes) reaching ~ 50-150 m above the crater rim. Continued growth of the intracrater lava dome was either recognized or assumed. Ibu lacked a working seismic instrument. Its hazard status remained at Level II (Yellow, a condition meaning 'caution or on guard' ('waspada' in Indonesian). Information Contacts: Directorate of Volcanology and Geological Hazard Mitigation (DVGHM), Jalan Diponegoro No. 57, Bandung 40122, Indonesia (URL: http://www.vsi.esdm.go.id/). During late March through late April 2008, the Center of Volcanology and Geological Hazard Mitigation (CVGHM) described mainly white plumes emitted from Ibu. On at least five days, however, the plumes were gray. During 17-31 March, frequent white plumes rose to an altitude of 1.5 km. On 31 March the plume altitudes increased to 1.6 km. During 4-5 April 2008, seismicity increased in amplitude and plume altitude increased to 1.8-2.0 km. On 5 April, the eruption plume was gray and material fell around the crater. Residents of nearby communities were not permitted to climb or approach the crater. Plumes that were possibly gray rose to altitudes between 1.6 and 1.9 km during 6-17 April. Gray plumes rose to altitudes of 2-2.1 km during 18-21 April. On 21 April, CVGHM warned that residents and tourists were not permitted within 2 km of the crater. Steam plumes rose above the crater during late May to late August 2004 (BGVN 30:03). Thermal anomalies detected by the MODIS instruments triggered MODVOLC thermal alerts (table 1) during that interval and the last quarter of 2004; alerts were also noted during February 2005, but not in 2006 and 2007. Thermal anomalies were again measured by the MODIS instrument in mid-May 2008 and continued to be detected through late October. Table 1. MODVOLC thermal anomalies over Ibu from late August 2004 to 20 October 2008. Courtesy of the HIGP Thermal Alerts System. Our last report on Ibu summarized MODVOLC thermal alerts (satellite thermal anomalies) from mid-May through late October 2008 (BGVN 33:09); those anomalies continued to be recorded almost monthly through June 2009. The anomalies suggest continued growth of a lava dome in the crater, an event previously documented by a photograph taken May 2000 and mentioned in BGVN 28:03. Authorities raised the hazard alert to Level 3 during June 2008. Several photos of Ibu in 2007 were taken by Arnold Binas (figure 2). Figure 2. Photos of Ibu taken on 27 July 2007 from a point on the NW crater rim, looking approximately SE. The top photo shows the location of the dome in the steep-walled crater. The bottom photo shows a close-up view of the dome. Courtesy of Arnold Binas. Information Contacts: Center of Volcanology and Geological Hazard Mitigation (CVGHM), Saut Simatupang, 57, Bandung 40122, Indonesia (URL: http://vsi.esdm.go.id/); Hawai'i Institute of Geophysics and Planetology (HIGP) Thermal Alerts System, School of Ocean and Earth Science and Technology (SOEST), Univ. of Hawai'i, 2525 Correa Road, Honolulu, HI 96822, USA (URL: http://modis.higp.hawaii.edu/); Arnold Binas, Toronto, Canada (URL: http://www.summitpost.org/user_page.php?user_id=42443, http://www.flickr.com/photos/hshdude/collections/72157600584144439/). Thermal anomalies detected by satellites (MODVOLC thermal alerts) through June 2009 suggested continued growth of a lava dome in the crater (BGVN 34:05). The Center of Volcanology and Geological Hazard Mitigation (CVGHM) reported that prior to 11 July 2009, white and gray plumes from Ibu rose ~ 600 m above the crater rim. After 11 July, the plumes were gray and rose only ~ 400 m above the crater rim. Ash from the gray plumes fell on areas within a 3-km radius of Ibu. 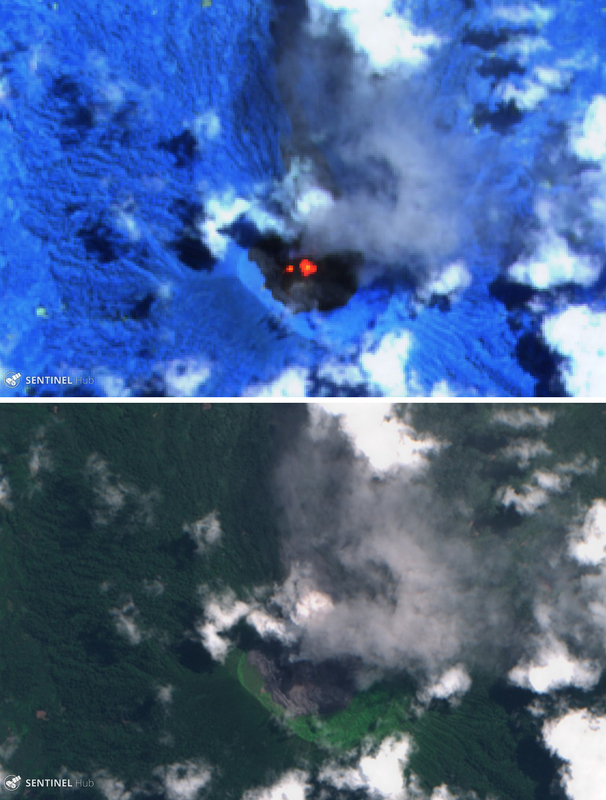 Observers noted an increase of eruptive activity after mid-July. During the period 27 July to 3 August, the total number of eruptive events showed a tendency to increase. Each eruptive earthquake was then followed by the expulsion of lava that reached the upper slopes. Plumes seen during 15 July to 4 August 2009 were grayish-white and reached a height of ~ 300-400 m above the crater rim. The lava extrusions accompanied rather strong rumbling noises on five occasions. The incandescent material was seen coming from the summit on 2 August 2009, and lava flows were seen. Later that day, a thunderous sound was followed by incandescence at the summit. On 3 August, incandescent material was ejected as high as 20 m above the crater. The total of explosion earthquakes increased from the 20-49 events of mid-July to 50-80 events during 27 July to 4 August. Villagers in Desa Duono, Going, and Sanghaji noted strong rumbling sounds. No volcanic earthquakes were recorded during that time frame. On 4 August 2009, 82 volcanic earthquakes were recorded. Each eruptive earthquake was followed by the expulsion of lava which reached the upper slopes. The observation post in the village of Duono, 5 km NW of Ibu, reported that the lava dome continued to grow. As a result, local residents were advised to prepare for times when they needed to wear masks that cover both the nose and the mouth. Visitors and tourists were asked to remain at least 2 km from the crater. 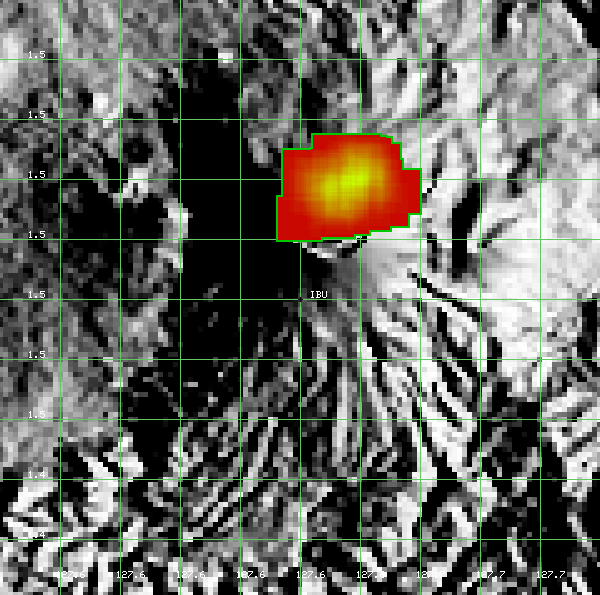 Activity at Ibu (figure 3) has been frequent since December 1998; the current eruption began in April 2008. Thermal alerts (MODIS/MODVOLC) continued into June 2009, and incandescent ejections were seen in early August (BGVN 34:10). Figure 3. Location map of Ibu volcano on Halmahera Island. Insert map shows the locations of other active Indonesian volcanoes with triangles. Courtesy of Agustan and others (2010). 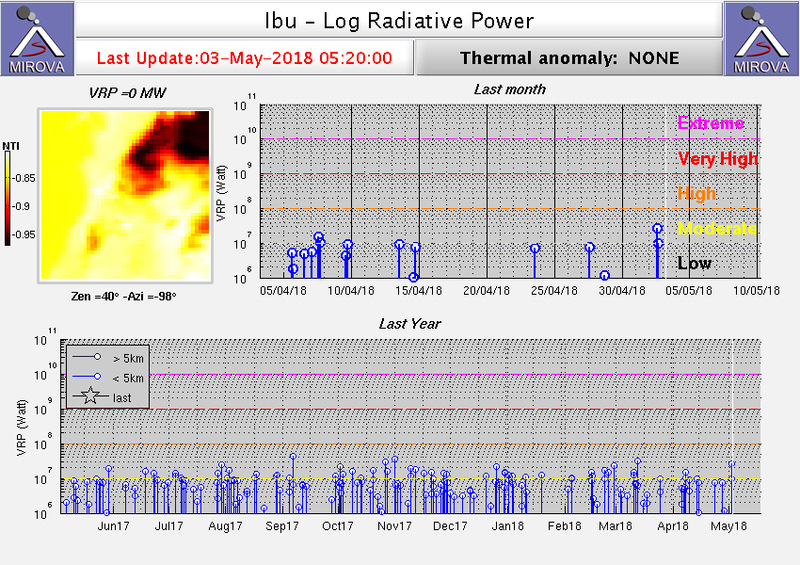 Between July 2009 and June 2010, thermal alerts at Ibu were detected by MODVOLC on an average of about five or more days every month (normally one pixel per pass?at least one alert each 55 days during the 1-year period), about the same frequency as those measured during the first half of 2009 and far more frequent than that for the 4-year period October 2004-October 2008 (BGVN 33:09). Ground observations reported below in August-September 2009 and January 2010 confirm continued doem growth. The Center of Volcanology and Geological Hazard Mitigation (CVGHM) reported that white and gray plumes rose 300-400 m above the crater rim during 15 July-4 August 2009 and that earthquakes became more frequent during 27 July-4 August 2009. Lava flows were seen on 2 August. Later that day, a thunderous sound was followed by incandescence at the summit. On 3 August, incandescent material was ejected about 20 m above the crater. 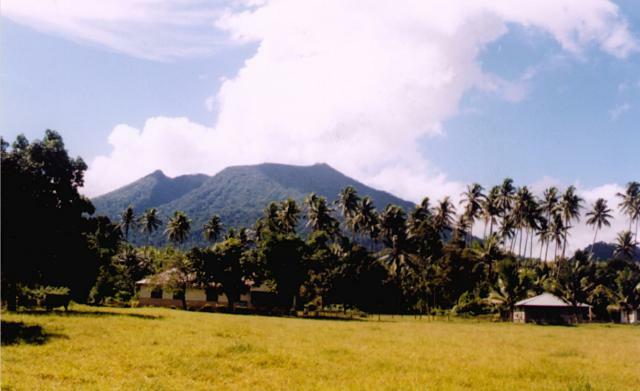 The lava dome had reached a height sufficient to be seen from Duono Village, about 5 km NW. Mark Rietze and Alain de Toffoli took some photographs of Ibu during a 31 August-7 September 2009 visit (figures 4-7), posted on the website of Th. Boeckel. The travelers noted that during the last 10 years the crater has been filled with a lava dome. The volcano has several vents that discharge ash and gas, along with Strombolian ejections. Only two vents were active during the visit. Figure 4. Photo of the edge of the Ibu crater, taken during 25 August-8 September 2009. The vegetation near the rim was partially charred, and lava from the dome caused small bush fires. Photo taken from the W rim looking toward the E rim. Courtesy of Alain de Toffoli and M. Rietze. Figure 5. Gas and ash emissions from the growing dome at Ibu, taken during 25 August-8 September 2009. Photo taken from the W rim looking E. Courtesy of Alain de Toffoli and M. Rietze. Figure 6. Two active vents in Ibu's crater, taken during 25 August-8 September 2009. Photo taken from the W rim looking E. Courtesy of Alain de Toffoli and M. Rietze. Figure 7. Dome growth in Ibu's crater with Strombolian ejections, taken during 25 August-8 September 2009. Photo taken from the W rim looking E. Courtesy of Alain de Toffoli and M. Rietze. Arnold Binas posted some photos that demonstrated rapid dome growth (figure 8). Before 1998, the crater was vegetated down to the bottom. The dome was distinctly lower in 2007 (BGVN 34:05). Binas commented that "After a period of no steam emissions at all, [the dome vent] would start steaming slightly to announce it's next eruption. After being done emitting rocks and ash, it would steam vigorously for a while before quieting down again." Binas was also told that material had started to go through a breach in the N side of the crater. Figure 8. Growth in a single day at Ibu's dome from one of the two vents erupting around 21 January 2010. The top photo was taken during a moment of quiet, and is the older image. Both photos taken from the W rim looking E. Courtesy of Arnold Binas. A recent article by Agustan and others (2010) used radar to measure ground deformation related to volcanic activity on Ibu. 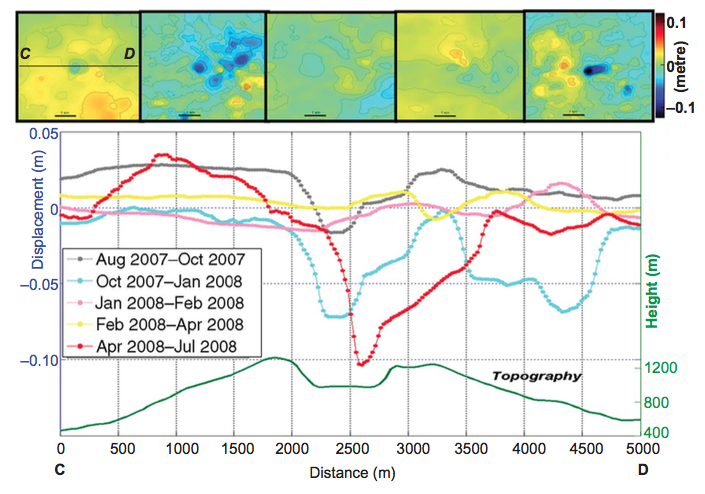 Specifically, they used longer wavelength (L-band) differential interferometry to identify an inflation-deflation region, especially in the crater area before the March-April 2008 eruption (BGVN 33:09). Reference. Agustan, Kimata, F., Abidin, H.Z., and Pamitro, Y.E., 2010, Measuring ground deformation of the tropical volcano, Ibu, using ALOS-PALSAR data, Remote Sensing Letters, v. 1, issue 1, p. 37-44, DOI: 1080/01431160903246717. Information Contacts: Center of Volcanology and Geological Hazard Mitigation (CVGHM), Saut Simatupang, 57, Bandung 40122, Indonesia (URL: http://vsi.esdm.go.id/); Hawai'i Institute of Geophysics and Planetology (HIGP) Thermal Alerts System, School of Ocean and Earth Science and Technology (SOEST), Univ. of Hawai'i, 2525 Correa Road, Honolulu, HI 96822, USA (URL: http://modis.higp.hawaii.edu/); Martin Rietze (URL: http://www.mrietze.com/info.htm); Arnold Binas, Toronto, Canada (URL: http://www.flickr.com/photos/hshdude/). Ibu (figure 9) has been intermittently active since 1998. Small explosions were noted during 2009 through January 2010 (BGVN 35:05). This report discuss seismic events from January 2011 to September 2011. Figure 9. Map showing Ibu volcano, on the island of Halmahera, Indonesia. Courtesy of Google Maps (prepared by GVP editor Jeff Jessens). According to the Center of Volcanology and Geological Hazard Mitigation (CVGHM), during January 2011 to 8 September 2011, white-to-gray plumes rose 200-400 m above the craters. For 2011, CVGHM reported seismically detected avalanches, which on average occurred 45 times/day during January-April, 60 times/day during May-July, and 46 times/day during the first week of September. During much of 2011 seismicity fluctuated, but decreased towards September, prompting CVGHM to lower the Alert Level to 2 (on a scale of 1-4) on 8 September. On 20 August 2011, observers from the nearby villages of Goin (exact location undisclosed) and Duono (5 km NW of Ibu) noted multiple eruptions from the S, E, and N craters. Plumes rose 50-250 m above the craters and an avalanche traveled 300 m in undisclosed direction. During the latter half of 2013, Ibu's lava dome continued to grow, and observers noted incandescent material and occasional weak white-to-gray plumes (BGVN 38:11). This report discusses activity between March 2014 and November 2015. Reports from the Center of Volcanology and Geological Hazard Mitigation (CVGHM) indicated that during 1 August-17 November 2015 white-to-gray plumes rose as high as 500 m above the craters. Seismicity during this period was dominated by signals indicating surface or near-surface activity, and continuing lava dome growth in the N part of the crater. The Alert Level remained at 2 (on a scale of 1-4). The public was warned to stay at least 2 km away from the active crater, and 3.5 km away on the N side. Thermal anomalies, based on MODIS satellite instruments analyzed using the MODVOLC algorithm, were observed frequently, and ranged from 1/month (February 2016) to 11/month (July 2014, April 2015, May 2015). Most were one pixel, but three pixels were observed on 5 September 2014 and 22 November 2014. The MIROVA (Middle InfraRed Observation of Volcanic Activity) volcano hotspot detection system, also based on analysis of MODIS data, detected numerous, almost continuous anomalies during the past year, though the frequency decreased from almost daily to averaging a few anomalies per week starting in late October 2015. Information Contacts: Center of Volcanology and Geological Hazard Mitigation (CVGHM, also known as PVMBG), Saut Simatupang, 57, Bandung 40122, Indonesia (URL: http://vsi.esdm.go.id/); Hawai'i Institute of Geophysics and Planetology (HIGP) MODVOLC Thermal Alerts System, School of Ocean and Earth Science and Technology (SOEST), Univ. of Hawai'i, 2525 Correa Road, Honolulu, HI 96822, USA (URL: http://modis.higp.hawaii.edu/); MIROVA, a collaborative project between the Universities of Turin and Florence (Italy) supported by the Centre for Volcanic Risk of the Italian Civil Protection Department (URL: http://www.mirovaweb.it/). During March 2014-March 2017, activity at Ibu consisted of lava-dome growth, occasional weak emissions containing ash (figure 11), and frequent thermal anomalies (BGVN 40:11 and 42:05). Ongoing activity between April and August 2017 consisted primarily of intermittent ash explosions. Data come from Pusat Vulkanologi dan Mitigasi Bencana Geologi (PVMBG, also known as CVGHM) and the Darwin Volcanic Ash Advisory Centre (VAAC). Figure 11. Photo of an ash explosion from Ibu's central vent in November 2014. Courtesy of Tom Pfeiffer, Volcano Discovery. On 3 April 2017, at 0757 (local), an explosion produced an ash plume that rose to an altitude of 1.7 km and drifted S. Seismic signals indicated explosions and avalanches. During the rest of April through August, occasional explosions generated weak ash plumes that generally rose to altitudes of 1.5-1.8 km (0.2-0.5 km above the volcano) and drifted in various directions (table 2). Table 2. Ash plume data for Ibu, April-August 2017. Courtesy of PVMBG and Darwin VAAC. Between April and August 2017, thermal anomalies (based on MODIS satellite instruments analyzed using the MODVOLC algorithm) were recorded 2-5 days per month, with no monthly trend. The MIROVA (Middle InfraRed Observation of Volcanic Activity) system detected numerous hotspots each month; all except one were within 3 km of the volcano, and all were of low or moderately-low power. Information Contacts: Pusat Vulkanologi dan Mitigasi Bencana Geologi (PVMBG, also known as Indonesian Center for Volcanology and Geological Hazard Mitigation, CVGHM), Jalan Diponegoro 57, Bandung 40122, Indonesia (URL: http://www.vsi.esdm.go.id/); Darwin Volcanic Ash Advisory Centre (VAAC), Bureau of Meteorology, Northern Territory Regional Office, PO Box 40050, Casuarina, NT 0811, Australia (URL: http://www.bom.gov.au/info/vaac/); MIROVA (Middle InfraRed Observation of Volcanic Activity), a collaborative project between the Universities of Turin and Florence (Italy) supported by the Centre for Volcanic Risk of the Italian Civil Protection Department (URL: http://www.mirovaweb.it/); Hawai'i Institute of Geophysics and Planetology (HIGP) - MODVOLC Thermal Alerts System, School of Ocean and Earth Science and Technology (SOEST), Univ. of Hawai'i, 2525 Correa Road, Honolulu, HI 96822, USA (URL: http://modis.higp.hawaii.edu/); Tom Pfeiffer, Volcano Discovery (URL: http://www.volcanodiscovery.com/). Ongoing activity at Ibu volcano from April through August 2017 consisted primarily of intermittent ash explosions (BGVN 42:10). Based on data and reports through April 2018, the eruption that began on 5 April 2008 appeared to be continuing. Monitoring of the volcano is the responsibility of the Pusat Vulkanologi dan Mitigasi Bencana Geologi (PVMBG), also known as the Center for Volcanology and Geological Hazard Mitigation (CVGHM). Additional data below come from the Darwin Volcanic Ash Advisory Centre (VAAC) notices, with infrared MODIS data analyzed by the MODVOLC and MIROVA systems. There were no reports of ash plumes from September 2017 through early March 2018. Although the summit area is often covered in fog, on 7-8 March ash plumes were observed rising 300-600 m above the crater rim and drifting W and S (table 3). Additional eruption plumes with ash were reported on 20 and 30 April. The Alert Level remained at 2 (on a scale of 1-4) and the public was warned to stay at least 2-3.5 km away from the active crater. Table 3. Monthly summary of reported ash plumes and MODIS thermal anomalies from Ibu for August 2017-April 2018. The direction of drift for the ash plume through each month is highly variable. Data from Darwin VAAC, PVMBG, and MODVOLC. Thermal anomalies identified by the MIROVA system using MODIS satellite data (figure 12) show that activity has been ongoing and almost continuous during May 2017-April 2018. Anomalies for the same time period detected and mapped using MODVOLC (figure 13, table 3) appear to be centered towards the north part of the crater and possibly extending down the N flank. This may indicate eruptive activity similar to that reported by PVMBG in June-December 2013 (BGVN 38:11) where the lava dome grew above the crater rim and sent incandescent material over a low notch in the rim and down a river valley towards Duono village, about 5 km NW. Figure 12. Thermal anomalies at Ibu shown on a MIROVA plot (Log Radiative Power) for the year ending 3 May 2018. Courtesy of MIROVA. Figure 13. A contour map showing MODVOLC thermal alert pixels at Ibu for the year ending 3 May 2018. Pixels are centered at the north crater rim and down the N flank. Courtesy of Hawai'i Institute of Geophysics and Planetology (HIGP) - MODVOLC Thermal Alerts System. The truncated summit of Gunung Ibu stratovolcano along the NW coast of Halmahera Island has large nested summit craters. The inner crater, 1 km wide and 400 m deep, contained several small crater lakes through much of historical time. The outer crater, 1.2 km wide, is breached on the north side, creating a steep-walled valley. A large parasitic cone is located ENE of the summit. A smaller one to the WSW has fed a lava flow down the W flank. A group of maars is located below the N and W flanks. Only a few eruptions have been recorded in historical time, the first a small explosive eruption from the summit crater in 1911. An eruption producing a lava dome that eventually covered much of the floor of the inner summit crater began in December 1998. Jezek P, 1979. Volcano resume--Ibu. Volcano News, 1: 7. Remarks: Subsidence of 10 cm was observed in the crater between April and July 2008 at Ibu volcano. Upper graph: vertical displacement maps, with 1 cm contour interval for period (a) August to October 2007, (b) October 2007 to January 2008, (c) January to February 2008, (d) February to April 2008, and (e) April to July 2008. Lower graph: corresponding profiles along line C?D on vertical displacement maps. From: Agustan et al. 2010. Reference List: Agustan et al. 2010. Agustan A, Kimata F, Abidin H A, Pamito Y E, 2010. Measuring ground deformation of the tropical volcano, Ibu, using ALOS-PALSAR. Remote Sensing Letters, 1, p. 37-44. Remarks: Subsidence of 7 cm was observed in the crater between October 2007 and January 2008 at Ibu volcano. Remarks: Between August and October 2007, 2 cm uplift was observed on the crater rim and 1 cm subsidence in the crater. There is no Emissions History data available for Ibu. Gunung Ibu volcano on the NW coast of Halmahera Island rises beyond a small village on its WNW flank. The summit of the stratovolcano is truncated by nested craters; the inner crater, 1 km wide and 400 m deep, contains several small crater lakes. The outer crater is breached on the north side, forming the deep valley seen here on the left side of the summit ridge. Few eruptions are known in historical time from Ibu, although it was erupting at the time of this February 1999 photo. Photo by Agus Karim, 1999 (Volcanological Survey of Indonesia). There are no samples for Ibu in the Smithsonian's NMNH Department of Mineral Sciences Rock and Ore collection. Large Eruptions of Ibu Information about large Quaternary eruptions (VEI >= 4) is cataloged in the Large Magnitude Explosive Volcanic Eruptions (LaMEVE) database of the Volcano Global Risk Identification and Analysis Project (VOGRIPA).